Black Friday Deals on Your Assignments Starts Now! 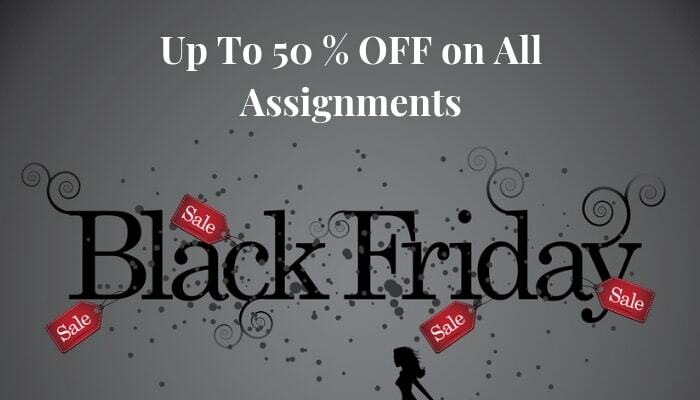 Assignment Help Blog Black Friday Deals on Your Assignments Starts Now! The term initially coined to describe the traffic and rush around roads after Thanksgiving has become one of the most awaited days of the year. All the credits goes to the sellers and retailers who saw this as a perfect opportunity to make profits with wide range of deals and discounts to offer. With shopaholics and others rushing to avail the discounts, it comes as a celebration. Be a part of the celebration ad enjoy. Just wander around and SHOP. With numerous deals and offers from all your favorite shops and service providers, it is a complete win-win situation. Your favorite merchandise store is offering great deals and you can’t wait to go and have a look at. Your friends are planning a trip and you are all set for this. Discounts are in the air and we are sure you are all set to avail them like a pro. But, in the hustle bustle of the excitement and zeal, you forgot the assignment your professor gave you few days back. We are here to rescue you from this situation. The assignment writers at Instant Assignment Help Australia are all set to make your enjoyment a little more delightful by providing you with the best assignment help. We are available round the clock for your assistance and ensure that you do not risk your grades because of us. Since the weekend is all about offer and deals, we have some of the best discounts to make your celebrations double. Our deals are not only about the Thanksgiving and events revolving around it. It is a lot more than just a four day weekend. We know students are mostly under budget, so our team comes up with various discounts and offers that makes it affordable to buy assignments. We also offer various referral points and provide cashback that adds to their discounts when they take the services again. Since Black Friday is round the corner, we are offering a minimum of 30% discount on each order that you place. Making things easy for students is our priority and thus, mobile apps serve the purpose the best. Along with the 30% off you can also avail an added 5% discount by installing our app. Help our community grow bigger and earn discounts by winning referral points. Refer us to your friends and make things easier for them. With each successful reference we give you some referral points that can be redeemed with your next order. Surviving the market for over ten years, we understand the needs of every student would be different. We make sure you get personalized assistance from our team that would make you comfortable and confident about your assignment. This Black Friday, it is not only about your favorite merchandise or food, it is also about online assignment assistance. Reach to us and get top-notch assignments that put you in your professor’s good book. Since our customers are students, we make sure that our charges do not bother their pockets. Placing an order with Instant Assignment Help Australia is a few click process. You just need to fill the query form on the website, submit it, and select the plan from the quotes you receive. We make sure to deliver your assignment before the deadline so that you get enough time to make revisions if needed. Relying on our online writing services may be tough. But, we are the best in the market and our clientele and survival history says a lot about it. We are sure with the discounts and offers we have for you in our bucket, you must be all set to be in the saving mode. With, the most awaited weekend in the calendar approaching make sure you get to enjoy the services and offers to the fullest!